Perform today’s essential office procedures with confidence! 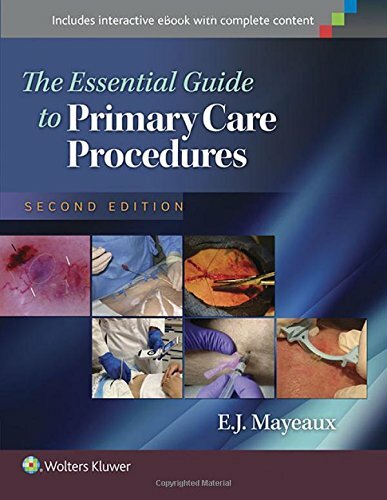 Packed with more than 1,500 full-color illustrations,The Essential Guide to Primary Care Procedures, 2nd Edition, is your go-to guide to more than 125 of the key medical procedures commonly performed in an office setting. This hands-on manual provides step-by-step, illustrated instructions for each procedure, as well as indications, contraindications, CPT codes, average U.S. charges for each procedure, and more. From the basic (cerumen removal and simple interrupted sutures) to the complex (colonoscopy and chest tube placement), this atlas covers the vast majority of skills you’ll use in your day-to-day practice. Stay up to date with new procedures and equipment, including dorsal penile block, peripheral nerve blocks, topical anesthesia, hand-held ultrasound, electrodessication and curettage, dermoscopy, aesthetic procedures, Wood’s slide examination,and more. Perform procedures more effectively and avoid common mistakeswith popular “pearls and pitfalls” sections. Go beyond the basicswith coverage of complications, post-procedures and pediatric considerations, and evidence-based references in each chapter. Get complete, practical coverage in every chapter, including background information on each procedure; indications and contraindications; sequential instructions, picturesand illustrations of the procedure; bulleted pitfalls and pearls; suggested CPT codes and average charges; and references. More evidence based medicine, with referencing throughout the chapters and appendices. View handy compilations of information applicable to many procedures, recommendations, and other practical information in the appendices. A great reference for the novice proceduralist who is learning procedures, or for the establish clinician who wishes to update or brush up on their knowledge.